Louisiana Power of Attorney Forms can allow an individual to legally and officially designate an agent, trusted individual, or “mandatory” (in certain instances) to act on his or her behalf when necessary. The term “mandatory” is used in Louisiana instead of agent or attorney-in-fact. There are many different types of POAs. Some are broad and can be used in a broad range of transactions for a long period of time. Others are more discreet and are only used for a specific transaction or type of transaction or limited time period. In all cases, it is important that you choose someone you trust to act in your stead. All forms should comply with RS 9:5647. Durable Power of Attorney – This type allows a person to designate a mandatory or agent to act on financial and other matters. This form stays in effect until revoked by the principal. It continues in effect even if the principal becomes incapacitated. Incapacitated means that the person is adjudged by a physician to be incapable of making decisions on his or her own behalf. Signing Requirements (§ 2993): No specific requirements, however, it is recommended to have a Notary Public sign a notary acknowledgment. General Power of Attorney – This type is similar to the durable form except that instead of continuing effect upon the principal’s incapacity, it becomes void and ineffective. Health Care Power of Attorney – This form is for use when you need someone to be available to represent your health care interests. Real Estate Power of Attorney – Used to appoint a representative to execute real estate transactions on the principal’s behalf. Limited Power of Attorney – A special type can only be used in a specific situation. Minor Child Power of Attorney – This form is used when you need to have someone in place to represent your child’s interests in the event you are unavailable to do so. 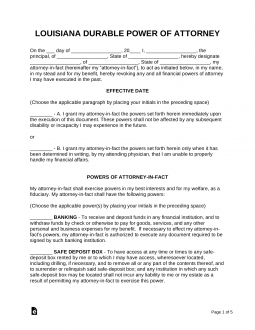 Power of Attorney Revocation Form – This is used to cancel any type of power of attorney you may have created in the past. Signing Requirements: Not specifically mentioned, however, it is recommended to have a Notary Public sign a notary acknowledgment. Tax Power of Attorney (Form R-7006) – This form allows a person to appoint a representative to handle his or her interests in front of the state tax authorities. Vehicle Power of Attorney – This form is used when you need a representative to act on your behalf as it relates to your motor vehicle.